Successfully my event calling for Cooking With Seeds going to enter its 8th announcement, actually Silpa of Anita's Kitchen wanted to host this month's event but unfortunately its seems she was bit busy with her new job, even i mailed her few days back asking about this month's event, till now i didnt get any mails from her, so thought of hosting this month's theme by myself, eventhough i'll be in break for few days, am happy to host this event after a long..So friends this month's seeds is going to be fennel seeds..
Fennel Seeds (Sauf) are very effective for digestive problems. These seeds can be chewed upon or had as a tea decoction for beneficial effects upon the stomach. In India, these are routinely chewed upon after meals to aid in digestion after a rich meal while acting as a herbal mouth freshener.Fennel seeds often provide quick and effective relief from many digestive disorders. They help to overcome gas, cramps, acid indigestion, and many other digestive tract maladies.Also these fennel seeds are very important in making many dishes in India, yea i cant prepare kurma or non vegetarian dishes without fennel seeds, my pantry always have a bottle of fennel seeds which i ground as fine powder often even for making masala with veggies or with meats, hope to see many delicious dishes prepared with fennel seeds for this month's event....Do send ur dishes prepared with fennel seeds, both vegetarian and non vegetarian dishes are welcome..
1)Cook or create dishes with fennel seeds as anything(vegetarian, vegan or non-vegetarian are accepted)..
4)I'll accept the old entries, if they are linked with this page.. Please take care to send all ur entries before 31th August 2010..
Do prepare ur dishes with fennel seeds and send me through mail, really waiting to see all ur delicious entries!!! I am in, I already have a recipe in my draft! Very nice event.Will send in my entries.Enjoy your vacation. will you count panchforon which has fennel with other four seeds? Nice theme for the event. Sure i will send my entries. Nice seed selection Priya, will definitely send my entries too. Priya tats an interesting theme, only if I was less busy, wud hv loved to participate. Anyways a award is waiting for u in my blog...congrats gal. I recall I had posted one traditional Bong dish..UDat dal with Fennel seasoning...Let me see if I can make some and post.. Very interesting theme. Would definitely send my entry before August 31st . Fennels is my most favorite spice too :) Will surely try to participate in this event, Priya.. Very nice and interesting theme. hey thats a nice event, coz I use it on an everyday basis to spice up something in the morning :) ....hey dear, I noticed the past few times I visited your blog, whenever I click the comments (to view comments and post) link on the bottom of all the recipes, a spam window opens (like the ones with some third party games/emoticons )....just wanted to let you know that. Count me in Priya!!! Have missed many of your posts shall do the catching up soon!!! nice choice for the seeds event. Great event ...count me in..
i never tried any food with seeds in it. or not that i recall from it. I haven't really played around with fennel seeds in my cooking. Sounds great! Interesting event.Will send some recipies soon. Great theme dear. I am in....Enjoy your vacation. 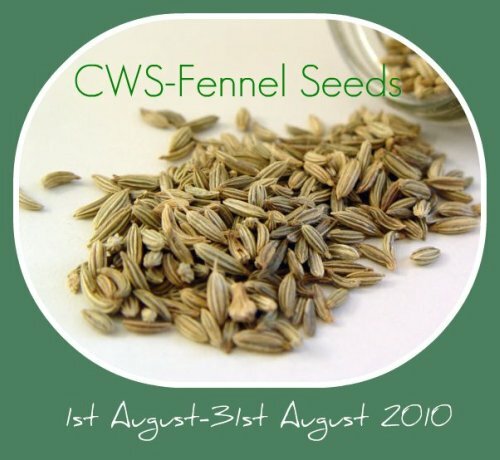 Like fennel seeds a lot,have used it often in my cooking.I have sent two posts for the CWS-Fennel Event.Thanks for hosting the event.